New Orleans, LA, May 9, 2017	(Newswire.com) - The leader in the lien law software and services space, zlien, announced the release of a new tool giving construction professionals the power to calculate lien and notice deadlines on projects nationwide. 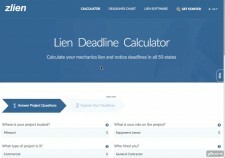 The Lien Deadline Calculator is the company’s latest free offering, adding to the thousands of complimentary guides, forms, and articles that tens of thousands of construction professionals have been relying on since 2007. In addition to zlien’s Lien Rights Management Platform and its self-service Lien Wizard for individual documents, zlien has always been committed to educating the construction industry on the complicated laws, deadlines and requirements associated with lien rights management. The Lien Deadline Calculator runs off of the same encyclopedic lien law database, utilizing our intellectual property and technological horsepower that drives both of zlien’s paid, core products. Through the continued creation of free resources and tools, like the Lien Deadline Calculator, zlien remains committed to making lien rights management easy. "zlien has always been about one thing: making lien rights easy so that construction companies can get paid. Lien rights are complicated and managing the lien rights process is an industry-wide challenge. A simple mistake like a missed deadline can stop a company's lien claim in its tracks. We created the Lien Deadline Calculator to be a free tool available for any construction company to empower them to identify important deadlines for individual projects and jobs." zlien's cloud-based platform makes lien rights easy, empowering a fair construction ecosystem that everyone can trust. Construction firms, subcontractors, material suppliers, equipment renters, and other project stakeholders nationwide use zlien to eliminate the administrative headaches and legal guesswork associated with lien waiver exchanges, preliminary notices, and mechanics lien compliance. zlien enables these firms to minimize financial risk and achieve a more seamless, transparent, and fair payment process. zlien has experienced explosive growth over the past few years and its platform now touches over 300,000 projects annually, worth billions of dollars in contract value. Investors include Altos Ventures and Brick & Mortar Ventures. For more information about zlien, or a free demonstration, visit www.zlien.com or call 866-720-5436.